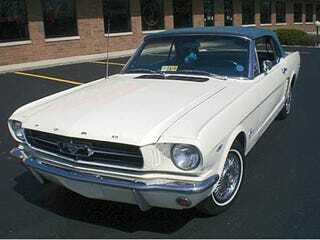 First Production Ford Mustang On EBay: Buy It Now For $5.5 Million! This 1964.5 Ford Mustang convertible, number #100212, is believed to be the very first Mustang built on the production assembly line and sold to the public. It's for sale on eBay. Buy it now for an astonishing $5.5 million. $5.5 million is a helluva a lot of ducats to spend on a 45-year-old car with no heater and an original sale price of $3,318.60, but this sucker's apparently been established as the very first Mustang to roll down Ford's assembly line. That means it's got a born-on-date of March 9, 1964, making it the 212th Mustang built — following 211 prototype and promotional cars built in the Allen Park prototype facility. Although it now lives as a museum piece, this first of an unbroken progeny of nine million cars wearing the same name, still managed to get over 55,000 miles on the odometer in its lifetime.